Thank you so much for taking the time to come to the Tech The Halls Casino NIght! It was a pleasure to have all of you join us for a night of fun and excitement all for a good cause. I hope that you’ll join us next year for another great event, but until then I wanted to give some updates on our efforts. Being our first fundraiser, we learned a lot in how to plan, communicate and execute a great fundraising event. In our efforts, we didn’t quite make our goal, but we have learned so much on how to do things “better” next year. We are going to extend the online campaign to ask for our members to help us raise another $3000 so we can help Screens for Schools until December 31, 2018. If you remember Amrita share how the program began with her volunteering to teach coding at Epic Elementary, and realizing that the students didn’t have the equipment necessary to run a program, she took it upon herself to raise money to change that reality. We are asking that you join her in helping her Screens for Schools initiative to raise the funds needed to help ensure that kids in Birmingham have access to digital literacy one school at a time. Your donation is *tax-deductible if you donate through our website, or if you wanted to write a check to TechAlabama, we will make sure that this gets passed on to Screens for Schools to be used for the purchase of 60 new Chromebooks and a charging cart. This year, Screens for Schools adopted Martha Gaskins Elementary to be the recipient, and you can watch this video to see Amrita interview the principal and share the opportunities to help. Screens for Schools Initiative with Martha Gaskins Elementary School from Amrita Lakhanpal on Vimeo. * TechAlabama is the charitable subsidiary of TechBirmingham. TechAlabama is a 501 (c) 3 charitable organization. Please contact christina@techbirmingham.com for more information. 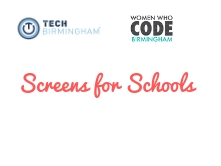 Each share, tweet, and email helps us spread the word about TechBirmingham, Women Who Code and Screens for Schools.